Fish based fertilizer products are excellent sources of N-P-K and trace minerals and considered to be some of the most powerful natural fertilizers and soil amendments in the world. Some products blend fish with seaweed or kelp for added nutrition and growth stimulation, They are available in two forms, solid and liquid. Hydrolyzed or enzyme digested fish utilizes whole fish and therefore contains the whole spectrum of fish nutrients, retaining more of the proteins, enzymes, growth hormones, vitamins, micro nutrients and oils, best of all it has no unpleasant odor. The cold press process allows the minerals and amino acids to become readily available to plants and makes those nutrients water soluble, so you can use them in foliage spraying or through drip and other irrigation systems. Because of better processing methods used in making fish based fertilizers, hydrolyzed fish products are considered to be superior to other fish products on the market today. The blending of seaweed or kelp to this product adds the many vitamins, trace elements and growth hormones, all in water soluble form, that are essential to healthy plant growth, making and excellent fertilizer even better. Typical NPK analysis varies by brand, synthetic nutrients usually added. Fish emulsion, Infamous for its foul smell, is a soluble fish fertilizer produced as a byproduct of the fish meal manufacturing process. Fish emulsion is heat processed, using high heat & acids, heat tends to denature amino acids in proteins, meaning that a lot of the nutrients and amino acids are either totally destroyed during processing or become unavailable to the plants. Commercial brands contain no fish oil and little or no aerobic bacteria. Many fish emulsion fertilizers are not OMRI listed because non organic nutrients are added to bring the NPK rating up to desired levels. Homemade versions unless boiled tend to be far superior to the commercial bands of fish emulsions. The Organic Materials Review Institute (OMRI) provides organic certifiers, growers, manufacturers, and suppliers an independent review of products intended for use in certified organic production. Typical NPK analysis varies by brand. Fish meal is a by product of the fish processing industry. It is made from whole fish, bones and offal, this is heat dried at a high temperature to remove most of the fish oil and water before being ground into a brown powder. It has a high nitrogen and phosphorus analysis and is a slow to medium releasing source of nitrogen making it a dependable soil builder. For a faster acting, water soluble fish fertilizer, use fish powders or liquid fish based fertilizer. Fish meal is also a good source for micro nutrients and provides food for beneficial bacteria in the soil, resulting in stronger healthier plant growth. 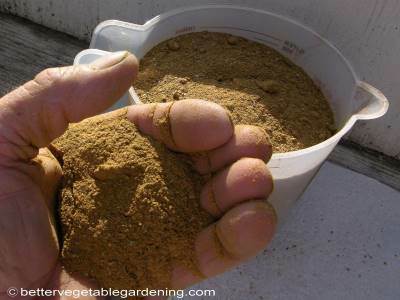 Fish meal is usually applied by working it into the soil around the plants, it is important to water the fish meal after application to assist in the breaking down process. 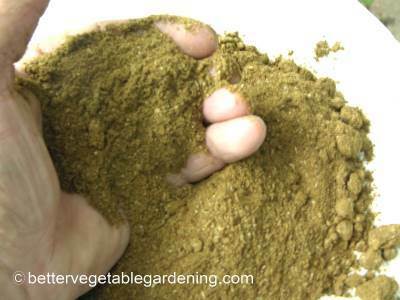 Fish meal is a better alternative to use in the home vegetable garden or compost heap than fresh fish waste. 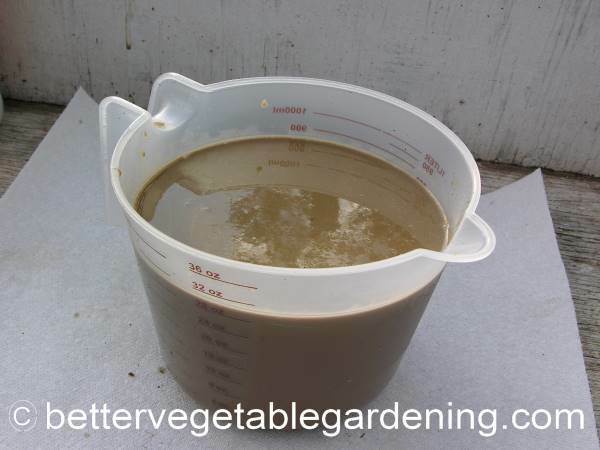 It is an excellent source of the nitrogen needed to balance your compost heap. However even though it doesn't have an odors anywhere close to that of fresh fish waste it is often enough to attract unwanted visitors, so it is advisable to have your compost heap contained or vermin proofed and to work the meal well into the soil when using it in the veggie garden. Fish powder being more soluble than meal is usually applied as foliage spray. It can also be run through most irrigation systems with good filtration. However like fish meal and fish emulsions the heat process use in manufacturing fish powders depletes the nutritional value of the final product and this is usually replaced with inorganic nutrients. Fish powder is fish meals ground to a finer texture making it more water soluble and fast acting. Use fish bone meal as a substitute for regular bone meal. Excellent source of phosphorus and calcium with a small amount of nitrogen.